The rapid progress of cell and gene therapies through clinical development is driving demand for late-stage clinical and commercial manufacturing capabilities. Transient transfection for vector production offers significant flexibility for cell and gene therapy development. Contract development and manufacturing organizations (CDMOs) with the ability to achieve high-yielding clinical and commercial manufacturing of high-quality viral vectors using transient transfection offer their clients this flexibility combined with scalability and speed to market. Transient transfection involves the introduction of genetic material into a cell without requiring integration of the material into the host cell genome. As a result, it is present in the cell for a limited period of time and is not passed on during cell division. It is effectively achieved using plasmid DNA, but high-purity and high-quality siRNAs, miRNAs, mRNAs and even proteins can also be used. The products of transiently transfected cells are thus typically harvested within one to three days post-transfection. Transient transfection is an effective method because it allows for the rapid production of viral vectors such as recombinant adeno-associated viral (rAAV), recombinant retroviral (rRV) and recombinant lentiviral (rLV) gene transfer vectors in the quantities needed for clinical development and commercial manufacturing.1 In addition, the speed and flexibility of transient transfection is ideal for rapid and cost-effective evaluation of processes and therapeutic vector candidates during early-stage development, and transition to late-stage production, allowing for smooth scale-up and transfer of processes and technology. There are few companies with the capability to commercially manufacture viral vectors; most of the 24 firms identified by Roots Analysis in a 2016 report are CDMOs.2 While in some ways similar to the production of conventional biological drug substances (use of bioreactors and the need for harvesting and downstream processing), in viral vector manufacturing care must be taken to ensure maintenance of viral vector potency/infectivity due to the higher fragility and complexity of these megadalton molecules.3 Transient transfection does present challenges for large-scale manufacturing where several factors can impact the process performance and product quality, including cell viability and density, the quality of the plasmid DNA, media and/or supplements, transfection reagent, and the cell line that is utilized in production. Different buffer systems and downstream purification methods are required. Product segregation, cleaning, changeover and line clearance are also essential and facilitated using well-designed facilities and procedures. It is also worth mentioning that accelerated development under FDA’s Fast Track and Breakthrough Therapy designations and Accelerated Approval program adds further challenges to the development of commercial viral vector manufacturing processes, given that timelines are significantly shorter.4 In these cases, it is effective to initially develop a scalable process that will provide high-quality product and be practical and cost-effective to implement in compliance with current Good Manufacturing Practice (cGMP) guidelines at the intended commercial scale. While process changes may not be avoidable during scale-up, evaluating potential impact from raw materials, equipment and manipulations needed for transient transfection at larger volumes can significantly mitigate risks of scale-up and reduce time to the clinical and ultimately commercialization. Transient transfection methods that utilize calcium phosphate (CaPO4), cationic lipids or polyethylenimine (PEI) to deliver the DNA can be utilized in adherent or suspension culture. Identifying the equipment and manufacturing platforms that allow effective scale-up is essential. Processes that occur in stirred-tank reactors (suspension culture) allow scale-up, as those that require plasticware vessels such as Cell Factories® (Nunc/Thermo) or CellStacks® and HYPERStacks® (Corning) involve scale-out (adherent culture) to obtain a larger batch size, and can benefit from automation. Advances in bioreactor technology are helping to alleviate some of these difficulties. 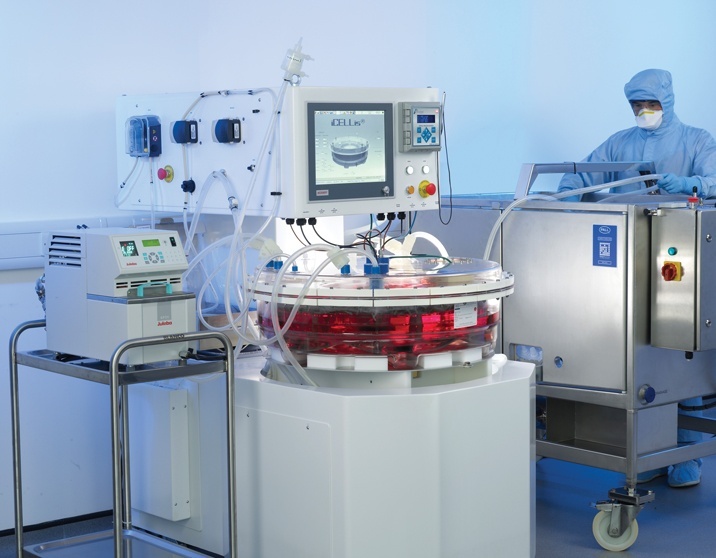 For instance, the iCELLis 500, a bioreactor from Pall Life Sciences (Figure 1), with up to 500 m2 of cell growth surface area, allows for transient transfection using adherent cell lines to a much larger scale than previously possible, in some cases providing sufficient capacity for late-stage clinical and commercial production. It is important, but challenging, to maintain comparable process performance for each unit operation when they are scaled-up. Cells and product intermediates (in-process materials before Drug Substance) typically are unstable, and the final vector product potency/infectivity may decrease significantly with increased processing time. Ideally, a similar time frame is achieved for a unit operation, regardless of scale, to ensure comparability of process performance (such as yield) and product quality. During transient transfection, DNA must be mixed with a transfection reagent and then added to the bioreactor. Fluid dynamics in different bioreactor volumes are a concern, as there is a narrow window of time in which mixing and subsequent addition to the cells should be achieved to maintain consistent transfection efficiency and production yield. For downstream processing, similar processing times can be achieved by scaling-up volumetric flow rates for chromatography or filtration steps. As mentioned above, transient transfection can be achieved via either suspension or adherent cell culture. Suspension cell culture is typically performed in stirred tank or wave bioreactors, with which the biopharma industry has extensive experience. Approaches for scaling these processes present unique challenges (sourcing plasmid DNA that is suitable as a raw material for cGMP manufacturing, mixing times, cell density) to transition from development to clinical and commercial production. Adherent cell culture, except when microcarrier beads are employed, requires the use of plasticware. Small-scale runs are typically performed using vessels comprised of plastic layers to which the cells adhere. There is a limit to the size at which these culture processes can be scaled, as vessels with 40 or 50 layers become cumbersome to manipulate, and often scale-out, and running a large number of vessels in parallel is required rather than scaling–up to a greater bioreactor volume. In addition to direct scalability, suspension culture, and adherent culture using microcarriers, avoids the need to scale-out plasticware processes. Suspension culture also reduces operator variability from manual manipulation of a large number of plastic vessels, as automation and on-line monitoring tools can be easily integrated with a bioreactor. It is also easier to monitor and keep process records for a single larger bioreactor, allowing faster development of process knowledge and often improved process performance.5 In general, suspension culture is more robust, as well as less labor and space intensive. To fully support its clients, Brammer Bio invests regularly in modern, state-of-the-art technologies. In certain scenarios, clients are unable to switch to these advanced technologies because their products are ready to enter into late-stage clinical or even commercial production, and they are locked into using their legacy platforms due to financial or time constraints. Wherever possible, however, Brammer is committed to migrating clients from legacy technologies to new platforms, including single-use stirred-tank or wave bioreactors, newer technologies such as the Pall iCELLis 500 system (shown in Figure 1) and appropriate disposable systems. Switching away from transient transfection and onto highly scalable manufacturing platforms such as insect cell lines/baculovirus6 or stable mammalian producer cell lines for vector production is also an area of expertise for Brammer Bio, and these plaforms rely on new analytical methodologies as well. As an example, analysis of rAAV vector particles has conventionally required the use of two common assays: one based on PCR to determine the number of vector genome–containing particles and one based on ELISA to determine the number of total capsid particles. These results are used to calculate the empty-to-full particle ratio, which is an important product attribute. Brammer Bio has replaced these two separate assays with one assay — analytical ultracentrifugation — and as a result, evaluation of vector particles can be achieved more rapidly and accurately, accelerating product and process development. Brammer has supported clients to transition from transient transfection processes using adherent cell lines to scalable suspension processes, many of which are also serum-free (to avoid the potential for exposure to prions). Conversion first requires weaning of the cell from serum and adapting the cells to suspension media. Lead cell clones that are capable of supporting the desired vector production yields and generational stability are identified, expanded and characterized. A master cell bank is generated for the clone that provides the optimum performance, which is subsequently used for manufacturing. 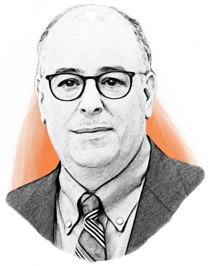 It is a labor-intensive, multi-month effort, but once completed, clients have a process and reagents that can be scaled as needed to meet demand for clinical material and commercial quantities. In January 2017, Brammer Bio acquired a 69,000-sq.-ft. manufacturing facility and nearby 49,000-sq.-ft. warehouse in Cambridge, MA, from Biogen, retaining over 100 employees with experience in phase III and commercial biologics production. The Cambridge facility will support large- and small-scale vector manufacturing in Q4 of 2017. One notable feature of the Massachusetts operations is the company’s large warehouse and distribution capability, which allows for raw material sourcing and warehousing to meet a range of production needs. Brammer has recently doubled its clinical manufacturing capacity in Florida, with additional cleanrooms and support space, and added staff, bringing the total team to over 270 at all locations. Furthermore, Brammer Bio also has a 50,000-sq.-ft. facility in Lexington, MA, that is being designed for modified cell therapy manufacturing. J. Fraser Wright. “Transient Transfection Methods For Clinical Adeno-Associated Viral Vector Production.” Human Gene Therapy 20.7 (2009): 698-706. Web. Richard Snyder. “Investing for Successful Advancement of Viral Vector Manufacturing.” Pharma’s Almanac Q1.8 Mar. 2017. Web. Manufacturing Of AAV Vectors For Gene Therapy: Building Processes For The Future. Genetic Engineering and Biotechnology News. 1 Jul. 2017. Web. Otto-Wilhelm Merten, Matthias Schweizer, Parminder Chahal, Amine A. Kamen. “Manufacturing Of Viral Vectors For Gene Therapy: Part I. Upstream Processing.” Pharmaceutical Bioprocessing 2.2 (2014): 183-203. Web. Robert M. Kotin, Richard O. Snyder. “Manufacturing Clinical Grade Recombinant Adeno-Associated Virus Using Invertebrate Cell Lines.” Human Gene Therapy 28.4 (2017): 350-360. Web.